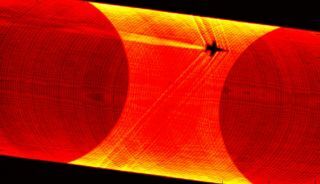 Supersonic shockwaves are clearly visible in this dramatic schlieren image of a NASA Dryden F/A-18 aircraft flying at a speed of Mach 1.1, and an altitude of 44,000 ft. during a GASPS flight. This image was released on Sept. 13, 2013. A stunning video shows how sonic-boom shockwaves distort the edge of the sun. The new shockwave video is not an art project but rather the work of scientists at NASA's Dryden Flight Research Center in California, who aim to reduce the intensity of aircraft sonic booms and thereby make commercial supersonic flight over land more feasible. These NASA jets are fast, obviously — faster than the speed of sound, which is about 761 mph (1,225 km/h) at sea level. But engineers have developed much zippier aircraft over the years. You can check out a new countdown of history's fastest military airplanes over at SPACE.com sister site LiveScience.com.